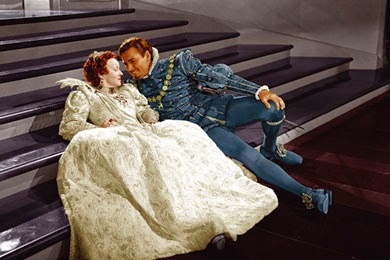 Good Queen Bess (Bette Davis) fall for ne'er do well Errol Flynn in The Private Lives of Elizabeth and Essex. The Stars: Bette Davis, Errol Flynn and Olivia de Havilland. Source Material: The play, Elizabeth the Queen, by Maxwell Anderson. 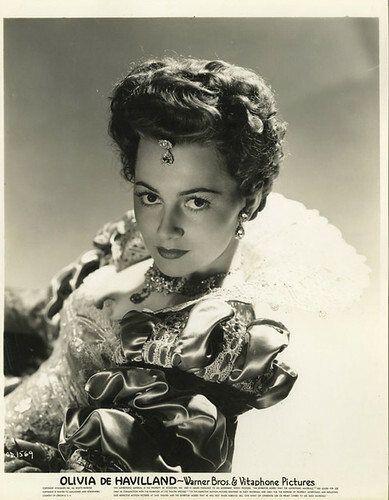 Olivia de Havilland in costume for The Private Lives of Elizabeth and Essex. Awards: Nominated for five Academy Awards: Best Color Cinematography; Best Art Direction; Best Sound Recording; Best Special Effects and Best Score. The Plot: An aging Queen Elizabeth (Davis) tries to recapture her youth through a romance with a much younger courtier, Robert Devereux, the Earl of Essex (Flynn). Complications arise when Essex becomes an over-mighty subject and tries to grab too much power from the Queen. 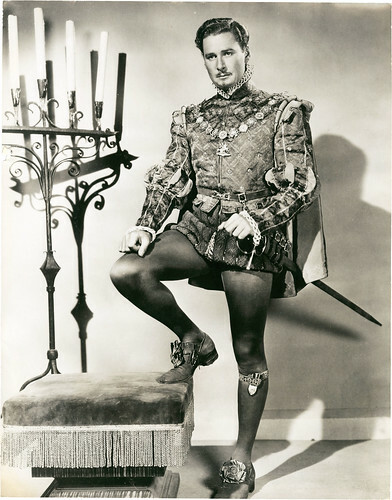 Errol Flynn in one of the elaborate costumes designed by Orry-Kelly for The Private Lives of Elizabeth and Essex. Backstory: Warner Brothers solved two problems by purchasing the rights to the hit Broadway play, Elizabeth the Queen. Bette Davis was one of their most successful stars, but she often battled with the studio over the quality of her roles. Davis had long cherished the role of Elizabeth, and playing the aging Virgin Queen gave Davis the opportunity to sink her teeth into a real acting challenge. The studio also needed another property for their swashbuckling star Errol Flynn and the Earl of Essex was a natural follow-up to earlier Flynn blockbusters like The Adventures of Robin Hood (1938) and Captain Blood (1935). 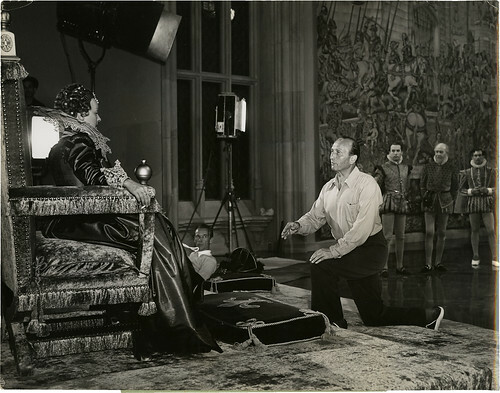 Director Michael Curtiz gives an imposing Bette Davis a few pointers on the set of The Private Lives of Elizabeth and Essex. 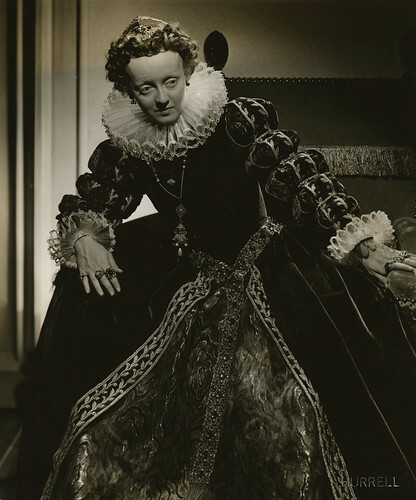 Best Performance: Bette Davis as Queen Elizabeth I. Davis wanted an acting challenge and she is magnificent in The Private Lives of Elizabeth and Essex. Davis, who was 31, convincingly aged herself by wearing pounds of heavy makeup and shaving her hairline and eyebrows to imitate Elizabeth's baldness. Davis did copious amounts of research, becoming something of an expert on Elizabeth and the Elizabethan era (she wasn't shy about correcting any production details she thought were lacking). Best scene: Davis lets loose on de Havilland, who is her rival for the affections of Flynn, with a memorable tirade. This scene is brilliantly acted by Davis, who conveys a wide range of emotions through her facial expressions. Curtiz' direction is superb, especially the shot of Davis inspecting her own profile in the mirror. Best Line: "The necessities of a queen must transcend those of a woman," Queen Elizabeth I.
Davis and Flynn: The animosity between Davis and Flynn on the set of The Private Lives of Elizabeth and Essex is a well-known old Hollywood legend. Davis resented Flynn because she thought he was a bad actor; in fact, she lobbied the studio hard to cast Laurence Olivier as Essex. Flynn resented Davis because he thought she was trying to steal the spotlight from him. The animosity boiled over onto the set, according to Flynn's autobiography. Davis, who wore pounds of clunky rings as Elizabeth, once slapped Flynn so hard during a scene that he saw stars and was momentarily deaf. Flynn got his revenge when he deliberately tripped Davis and, as Flynn gleefully remembered, "she went about two feet off the ground." An add for Chesterfield cigarettes features Bette Davis and Errol Flynn. The Title: The Private Lives of Elizabeth and Essex is an awkward title, but it wasn't the first choice for the film. The original title was Elizabeth the Queen just like the play, but Flynn objected because his character wasn't mentioned. The next choice, The Knight and the Lady, angered Davis, who didn't want Flynn to receive top-billing. Davis was also upset because she was playing a queen and not a mere lady. Elizabeth and Essex was under copyright for a book title, so Warner's reluctantly decided on The Private Lives of Elizabeth and Essex. Fun Fact: The elaborate costumes Davis wore to play Elizabeth weighed around 60 pounds. Bette Davis in one of her elaborate costumes for The Private Lives of Elizabeth and Essex. Why it's essential: The Private Lives of Elizabeth and Essex is a great historical epic and a highly entertaining swashbuckler. Davis is superb, the production details are outstanding and Curtiz provides his usual crisp direction. Davis was half right about Flynn. He isn't really trying to give a nuanced performance; in fact, he really isn't trying to give any kind of a performance other than as suave movie star Errol Flynn. This actually kind of works in a role where Flynn is playing a notorious cad who doesn't have any loyalty to anyone but himself. Availability: The Private Lives of Elizabeth and Essex is available on DVD and video on demand. Next week, Henry Fonda and Claudette Colbert tame the frontier in Drums Along the Mohawk. I really enjoyed this movie (and your post)! I think Flynn is his handsomest in this film (the next would be "The Sea Hawk"). It's really awkward though seeing him not go for de Havilland. It just feels wrong! II thought it was so peculiar and funny that Chesterfield chose that film for a promotional tie in.There weren't even cigarettes in Elizabethan England.